The WVA pre-season tournament was held on Saturday (26 September) at Lavington School. There was only one Comets team (consisting of Cliff, Neil, Jörg, Matt Walker, Dan, Anji, David and Irénée). The first match was against Devizes Barrels against whom the Comets scrapped through. Next up was Olympiad and a fairly even match until the last five minutes when some fine serving from Dan opened a gap to give a decisive victory). Victories against Salisbury and Melksham and a narrow 27-25 loss to Devizes 6X saw the Comets through to the final. However, it was at a price as Irénée injured his ankle. With Neil and Dan as well as Irénée having already departed for other commitments, the Comets were unable to match 6X and had to be satisfied with the runners-up trophy. 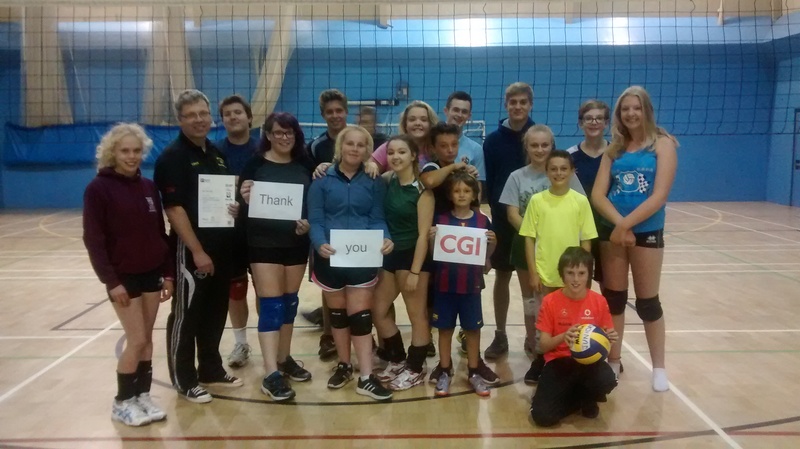 Major IT firm CGI has provided the Calne Comets with a grant from its UK charity committee to help with the costs of our coaches getting qualifications. In particular our Junior Development Officer, Neil Bentley, has obtained his Level 1 Award in Coaching Volleyball. Our junior members show their appreciation for the donation from CGI which has helped our Junior Development Officer, Neil Bentley (second from left), receive his level 1 award. The club and in particular the juniors want to thank CGI and their staff for the donation.